If you haven't heard of Of Two Minds you will. It's an upstart line that launched last year, with Paris-bred, LA-based (and Isabel Marant BFF) Sunjoo Moon at the helm. It's poised to be hugely successful, because Moon makes clothes we all want to wear: comfortable yet distinctly chic. 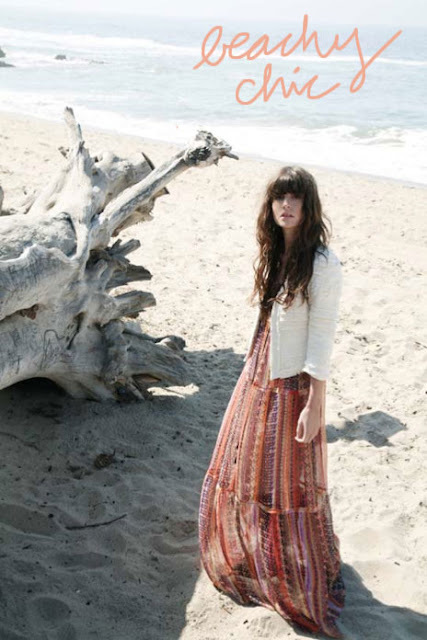 What's more, she deftly imbues each and every piece with her own Malibu beachy-meets-French-chic vibe. For her spring collection, Moon combined lightweight ethnic-spirited prints with heavier tailored silhouettes. The result is pretty perfect, with billowy vivid patterned dresses, embroidered jackets and snappy skirts that are suitable for both the beach and the city. Since the weather has been relatively balmy in LA for the last few days, these filmy, floor-grazing sundresses and colorful tunics from her spring collection are all I want to wear. Look for Of Two Minds at ronherman.com in early 2012. Um, I am dying over that first image. I need the entire look. When will they be selling online? And for the record, I'm all done with winter and would very much like to skip to spring 2012. Thanks for the heads up on this line.